Making a strong pitch for self- reliance in defence production, Prime Minister Narendra Modi on Friday said this is needed to make the country completely secure from any threat. In his brief speech at the ‘Sanik Samelan’ in Srinagar, the Prime Minister spoke about encouraging defence production in the country and said it was important for securing the borders of the country, official sources said. Modi was quoted by sources as saying that his government will make every effort to keep the “jawan smiling”. If a jawan is smiling, he will be able to “serve our motherland in more better way”, the sources quoted him as saying. Modi, during his tenure as Chief Minister of Gujarat, had spoken about making the country self reliant in defence production and also enable it to export defence equipment to other nations. “In Gujarat, we have made a small effort in this regard. In our engineering colleges we are working towards starting a subject related to defence manufacturing,” he had said last year on the 15th anniversary of Pokhran nuclear tests. 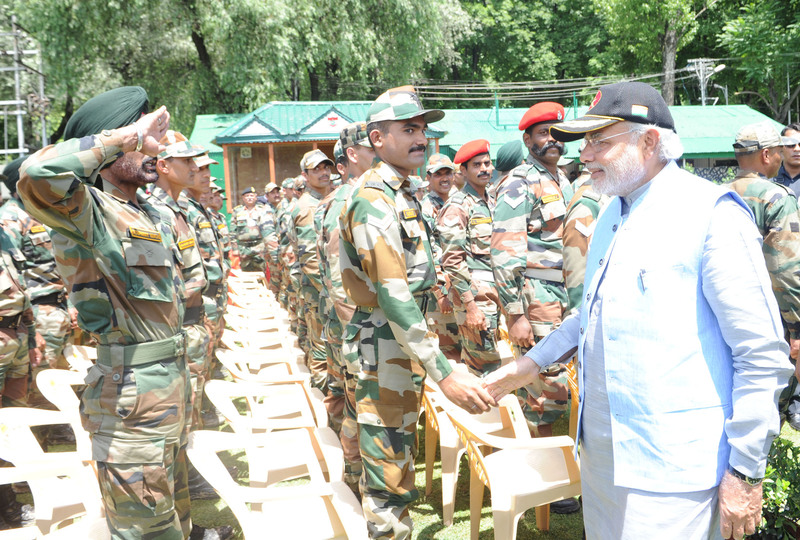 Later, the Prime Minister let go his security and interacted with the soldiers. He was seen walking past everyone and greeting them with “Jai Hind”. Modi assured the jawans that their worries will be taken care by the government which will make all steps to make their lives much better. Ahead of his speech, Army Chief-designate Lt Gen Dalbir Singh Suhag welcomed the Prime Minister and spoke about various issues related to army jawans. Earlier, Modi paid tribute to the martyrs who laid down their lives while protecting the borders in Jammu and Kashmir. He laid a floral wreath at the War Memorial at the Srinagar-based Chinar Corps of the Army in Badamibagh Cantonment in Srinagar. Others present at the function were state Governor N N Vohra, state Chief Secretary M I Khanday, Director General of Police K Rajendra and top army officials.